The DRG-AR Series modules are a family of DIN rail mount limit alarms with dual setpoints and two contact closure outputs. The field configurable input and alarm functions offer flexible setpoint capability. Modules are available for a variety of input types including thermocouples, RTDs, DC and AC current and voltages. Each module can be set to a number of input ranges via an input selector switch. The alarm points and dead band are adjusted by potentiometers. All modules are equipped with 3 front panel LEDs. The first is a dual function LED labeled input. This green LED indicates line power and input signal status. Two red LEDs indicate the relay state for each setpoint. An illuminated red LED indicates the tripped condition. The DRG-AR Series modules are equipped with two SPDT relays, rated at 120 Vac or 28 Vdc at 5 amperes. Each of these relays is independently controlled by the field configurable setpoint and deadband. The field configurable limit alarm setpoints can be configured for HI or LO, failsafe or non-failsafe operation. Each of the setpoints has a respective HI or LO deadband. In a tripped condition, the setpoint is exceeded and the appropriate red LED will illuminate. The trip will reset only when the process falls below the HI deadband or rises above the low deadband. In failsafe operation, the relay is energized when the process is below the HI setpoint or above the LO setpoint (opposite for non-fail-safe). In the fail-safe mode, a power failure results in an alarm state output. LSI circuitry in the DRG-AR Series prevents false trips by repeatedly sampling the input. The input must remain beyond the setpoint for 100 milliseconds to qualify as a valid trip condition. Likewise, the input must fall outside the deadband and remain there for 100 milliseconds to return the alarm to an untripped condition. This, effectively, results in a dynamic deadband. The DRG-AR-AC is a DIN rail mount, AC voltage or AC current input limit alarm with dual setpoints and two contact closure outputs. Input voltage spans from 100 mVac to 200 Vac and input current spans from 10 mAAC to 100 mAAC can be field configured. For current spans of 1 to 5 Amps a 0.1. (5 W) shunt resistor (Model# DRG-C006) is available. The DRG-AR-RTD is a DIN rail mount, RTD input limit alarm with dual setpoints and two contact closure outputs. The module features up to 8 temperature ranges for each RTD type. The DRG-AR-TC is a DIN rail mount, thermocouple input limit alarm with dual setpoints and two contact closure outputs. The module features up to six temperature ranges for each thermocouple type to ensure accuracy and maximize setpoint resolution. A bipolar switch is provided for temperature ranges below 0°C. The DRG-AR-TC is configurable as a single or dual setpoint alarm, with HI or LO trips, upscale or downscale burnout detection and failsafe or non-failsafe operation. The DRG-AR-DC is a DIN rail mount, DC voltage and DC current input limit alarm with dual setpoints and two contact closure outputs. Input voltage spans from 10 mV to 200 V and input current spans from 1 mA to 100 mA can be field configured. Bipolar inputs are also accepted. The module also features 24 Vdc voltage source (isolated from line power) for transducer excitation. 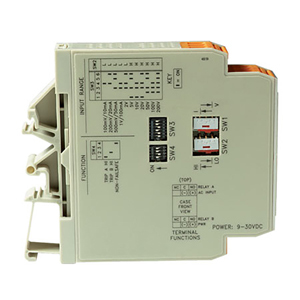 참고: Each DRG-AR Series limit alarm module is supplied with a complete operator's manual.